Western Environmental Liner offers a wide variety of tarps & covers for a multitude of applications, including hay covers or tarps. 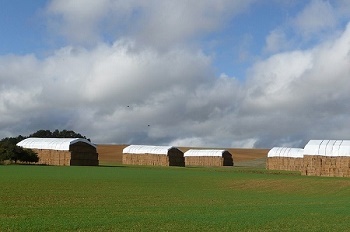 Western Environmental liner’s parent company, Western Ag Enterprises, started the business manufacturing hay tarps which enabled Western Environmental Liner to learn from their experience. This has enabled Western Liner to make some of the highest quality tarps & covers on the market today. Western Environmental Liner has access to sewing machinery, grommet machines, d-line equipment, heat welding equipment, radio frequency machines, as well as other equipment used to make almost any type of cover or tarp imaginable. Some of our specialties are Rain Covers used in many landfills, baseball field covers, stadium seat covers, football field covers, tennis court covers, golf course covers, liner covers, & hay tarps. We have made several custom, large-volume orders of covers for unique applications as well. If you have a tarp or cover project please contact us and we will help you.